The main mission of Football Addicts is to try and democratize football, to lift the voices and opinions of the fans, to get the media and decision-makers to listen to them. One way to do this is through polls in our app Forza Football which has three million monthly users worldwide. 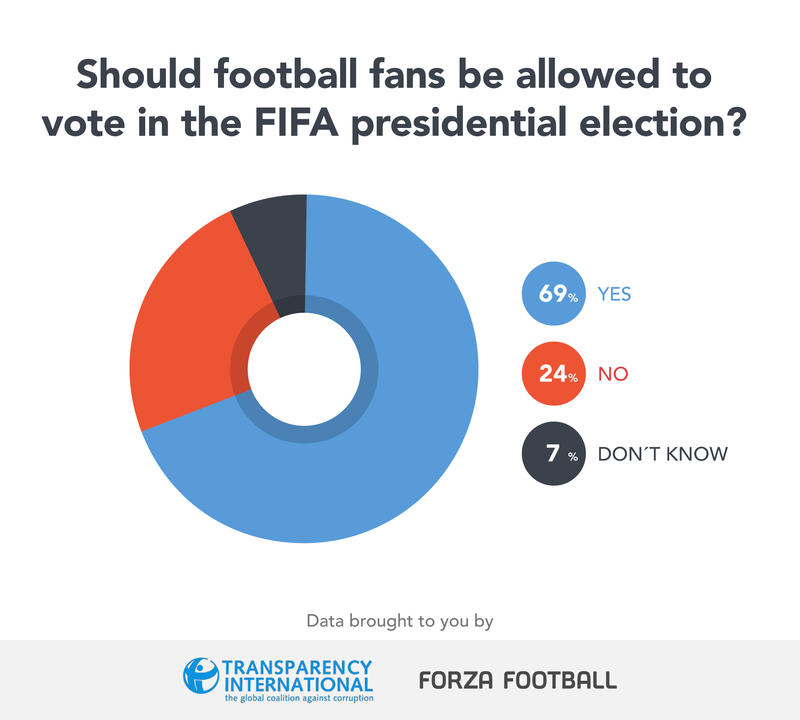 Back in May 2015 we teamed up with Transparency International to ask fans a few questions ahead of the FIFA elections. 35 000 people participated and four out of five did not think that Sepp Blatter should run again for president of FIFA. Read more about that poll here. Now Sepp Blatter is out of the picture (well, not really but at least he is not running for president again) and FIFA is about to elect a new leader on Friday February 26th. 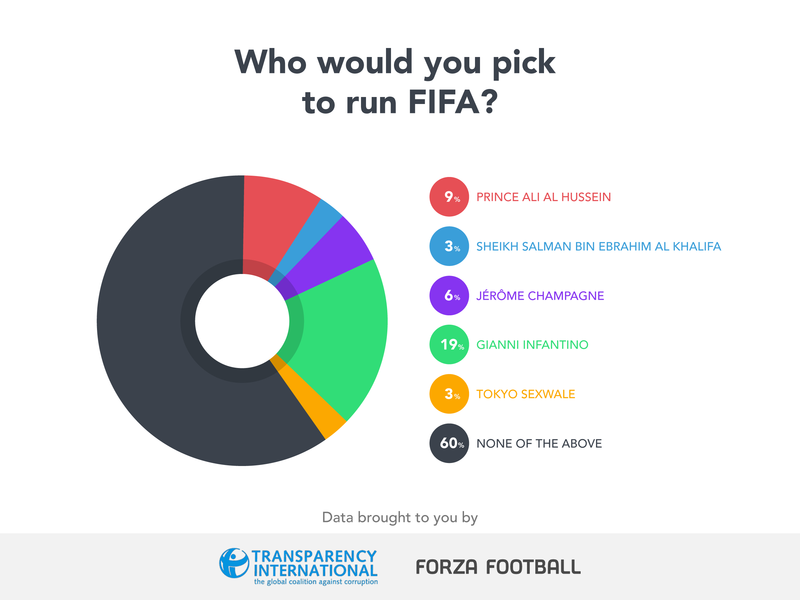 We have once again worked together with global anti-corruption organisation Transparency International to find out how the fans feel now about the highest office in football and the candidates for the presidency. Nation-by-nation, Chile had the least confidence in FIFA (88% saying no), while Argentina and Ireland (both 80%), and Netherlands (78%) also had very low confidence. 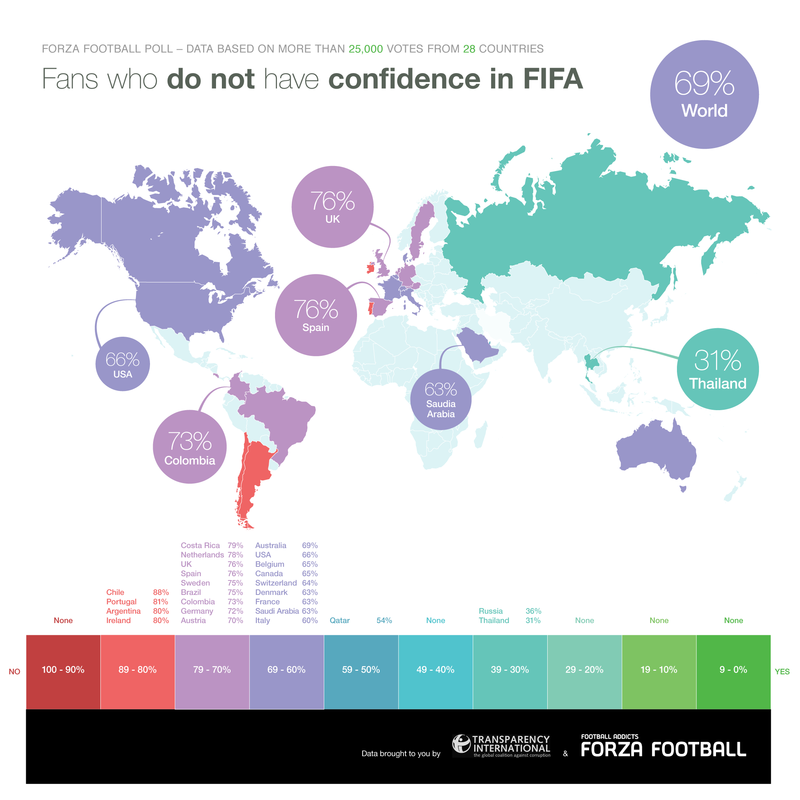 UK (76%) and USA (66%), also had low confidence in FIFA. 2. Do you believe FIFA will ever restore its reputation? That more fans believe FIFA will restore its reputation than don’t, signifies a glimmer of hope for the organisation. Fans from Russia (77%), Thailand (72%) and Saudi Arabia (64%) were most optimistic. 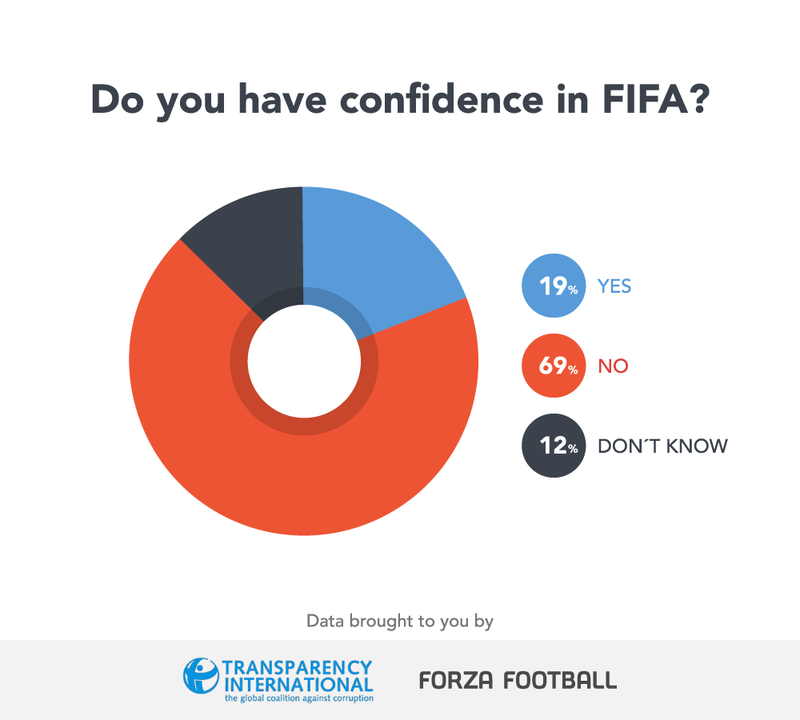 41% of Britons and 50% of Americans believe that FIFA can turn itself around and restore its reputation. Fans from UK (77%), Austria (77%), and Belgium (78%) were most in favour of fans being allowed to vote in the FIFA presidential election. 73% of fans in USA agree. 4. Has the FIFA scandal affected how much you enjoy football? Fans from Chile (61%), Portugal (56%) and Argentina (56%) were most affected by the scandal. 45% of fans in Britain, and 44% in America, stated that the FIFA scandal had affected how much they enjoy football. The majority of respondents from every nation, except for Saudi Arabia, chose ‘none of the above’. 37% of Saudi fans favoured Prince Ali Al Hussein. Second to ‘none of the above’, Prince Ali Al Hussein is the candidate of choice for UK, USA, Saudi Arabia, Ireland, Netherlands, Australia, Argentina, Chile, and Thailand. Second to ‘none of the above’, Gianni Infantino is the candidate of choice for Sweden, Italy, Portugal, Denmark, Germany, Spain, France, Colombia, Belgium, Canada, Switzerland, Austria, Russia, and Costa Rica. 6. Do you think football is more corrupt than other sports? 79% of fans in Argentina, 73% in Portugal, and 69% in Chile stated that football is more corrupt than other sports. 60% of fans in Britain, and 56% of fans in USA, stated that football is more corrupt than other sports. The top three countries for wanting more women in FIFA are Costa Rica (83%), Colombia (78%), and Spain (76%). However, over half (52%) of fans in Russia said that they didn’t want more women in FIFA. 69% of Britons, and 72% of Americans, stated that there should be more women in FIFA. While it’s crucial that the FIFA scandal has been, and continues to be, widely discussed, the opinions and feelings of the most important people in football, the fans, are often ignored. By teaming up with Transparency International we are giving football fans from all over the world a collective voice, and putting the power back into their hands. We hope that the next FIFA President will take into account how disillusioned football fans are with the sport they love.